Community. He was a former, non-Executive Director of Zenith Bank PLC Board. An author and responsible family man. He was married to Mrs.Elizabeth Ebie, nee, Ajabor, who passed on, in April, 2014.The marriage was blessed with children. Sir Ebie has indeed contributed immensely towards the development of both the society and humanity. His achievements as a professional and community leader speak volume. His love for his people and passion for the growth and development of Ika land was infectiously inspirational. He was a role model, a mentor, selfless and honest leader. Onu Ika is exceedinglyproud to have him as one of her pioneer leaders. He will be missed for his audacity, honesty, sagaciousness, disarming humour, ingenuity and above all love for God and his people. 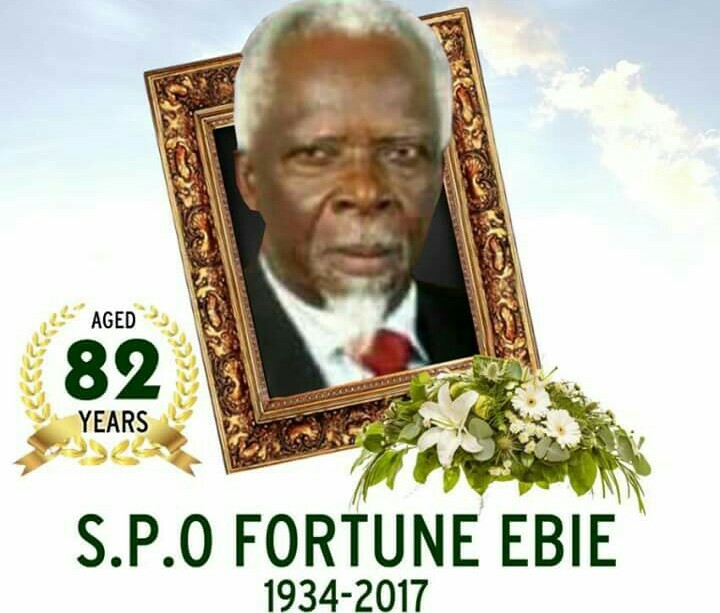 Adieu our dear Sir S.P.O Fortune Ebie, rest on till we meet to part no more. For and on behalf of Onu Ika Nigeria. PrevTribute to late Sir Ebie by Onu Ika.